THE PRINT MEDIA, Journalism in Crisis narrated by Bill Baker, PhD., focuses on Daily Papers, News Magazines and the Internet. The documentary assesses changes to and the impact of new Web Based Media. Viewers around the world now have live breaking news, online multimedia, play-by-play sports, financial markets, educational programs and unlimited entertainment, all in the palm of their hand. This while newspapers and print forum as they has been known struggle, not just for relevance, but survival. Is quality being replaced by quantity, accuracy for speed, substance for headline, and is there a role for traditional print media in today’s high tech world? With a career that spans more than 40 years in the industry, William F. Baker, Ph.D., has taken a leading role in helping to shape American broadcasting in both the commercial and public sectors. As an author, lecturer and the recipient of many honors and awards, he is a sought-after expert in the field and a well-known advocate for the educational potential of television. 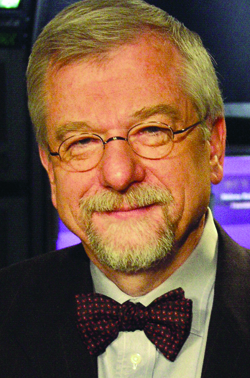 In February 2008, Baker became President Emeritus of WNET, parent company of public media providers THIRTEEN and WLIW21. Baker served as President and Chief Executive Officer of Educational Broadcasting Corporation for 20 years. THIRTEEN is the flagship public broadcasting station, the premier producer of cultural and arts programming in America, and the most-watched public television station in the United States. In addition to his role as President Emeritus, Baker is currently Journalist in Residence at Fordham University and the Claudio Aquaviva Chair at the Graduate School of Education in New York. As narrator and contributor to the documentary project about the demise of print news, "THE MEDIA, JOURNALISM IN CRISIS" achieved high ratings in the New York television market as well as The New York Times selection and review. Copyright (c) 2015 The Authority Group. All rights reserved.